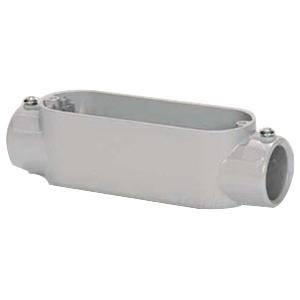 Sepco Type C conduit body of trade size 3-inches, is suitable for use with threaded rigid conduit and IMC. It features sand-cast/copper-free aluminum construction with aluminum enameled finish for corrosion and weather resistance. Conduit body with NPT connection, accommodates three conductors of size 250-MCM. This straight side access conduit body with screw-on cover, has two hubs and 188-Cubic-Inch capacity. It features flat back design for easy mounting close to walls. It measures 13.19-Inch x 4.56-Inch x 4.56-Inch. Conduit body is UL and cULus listed.